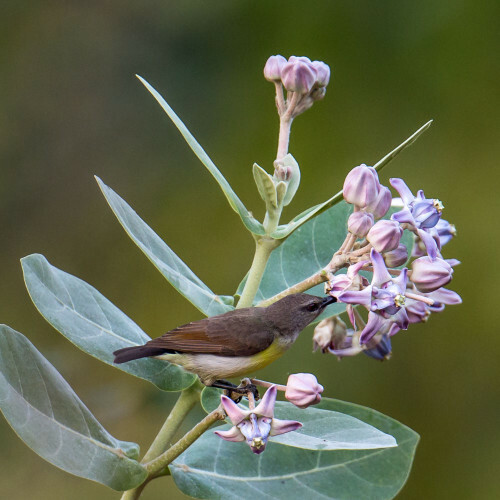 I saw these sunbirds feeding on the Calatropis flowers. 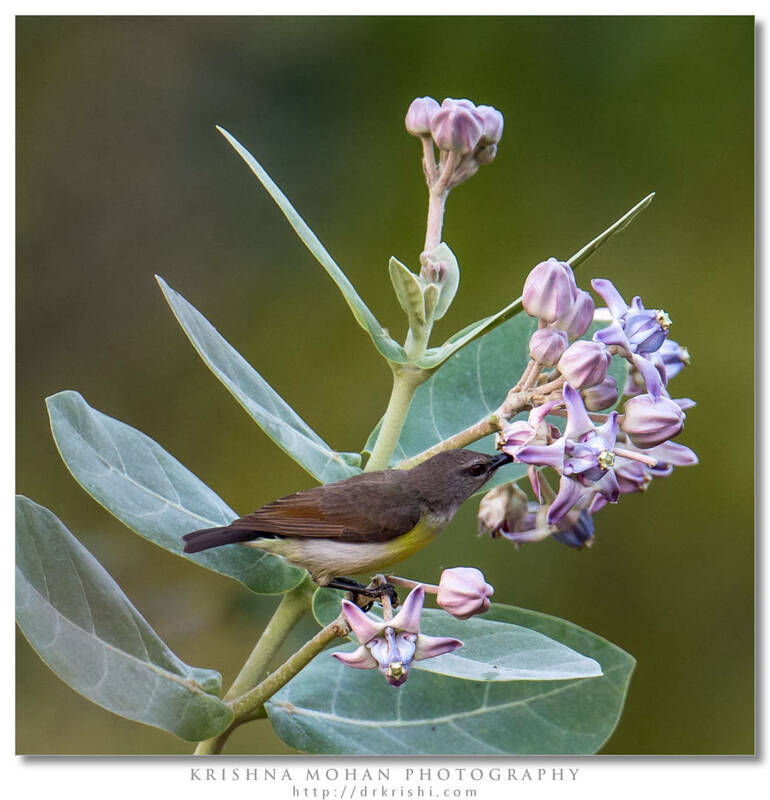 Both male and female were taking turns to feed a small bunch of these crown flower nectar. As it was late December evening light which was quite diffuse and low, I used a relatively slow shutter speed (1/320th of second) to capture these birds at ISO 1250. I was using Canon EOS 5D Mark III with my Canon EF 300mm f/2.8L II IS USM and Canon EF 2X III Extender. This combo gives me sharpest results at f/6.3 aperture. So I used that setting. 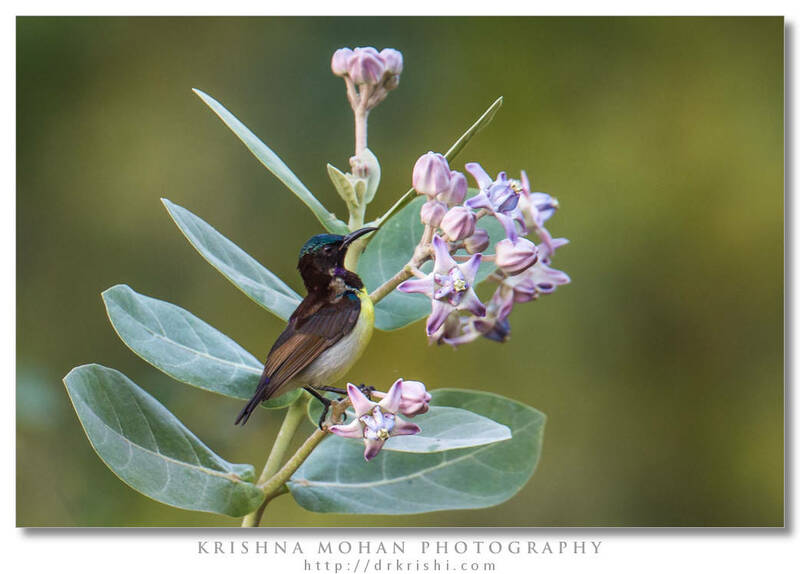 These sunbirds were moving fast but were stopping just a fraction of second between their flutter and that gave me opportunity to click them at such a speed. I was using my Benro C45T Carbon Fiber Monopod for support. 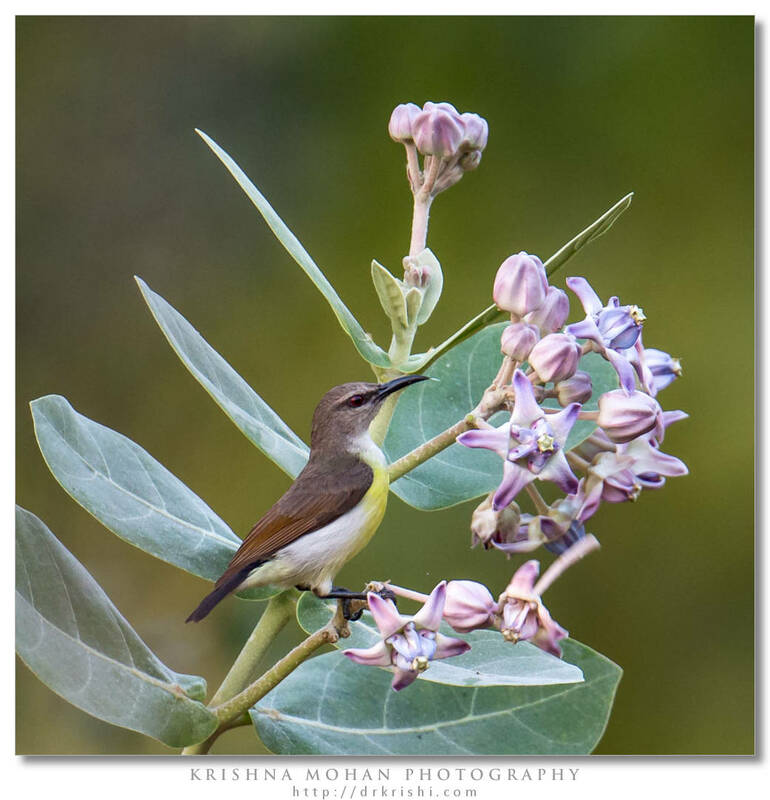 The Purple-rumped Sunbird (Leptocoma zeylonica) is a sunbird endemic to the Indian Subcontinent. 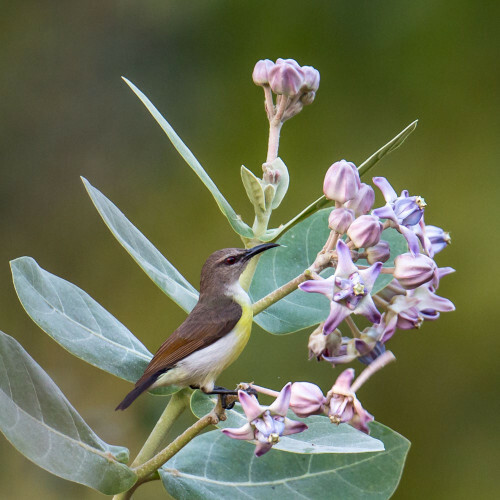 Like other sunbirds, they are small in size, feeding mainly on nectar but sometimes take insects, particularly when feeding young. They can hover for short durations but usually perch to feed. They build a hanging pouch nest made up of cobwebs, lichens and plant material. 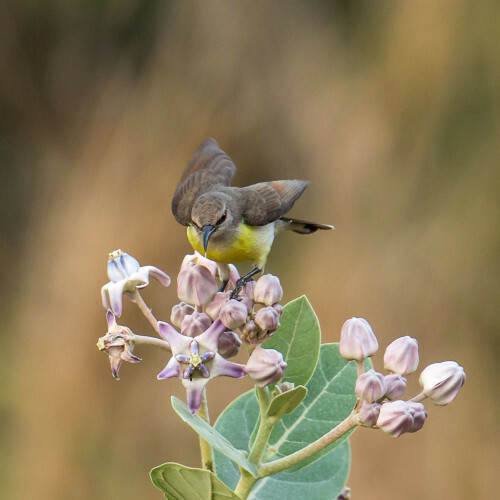 Males are brightly colored but females are olive above and yellow to buff below. 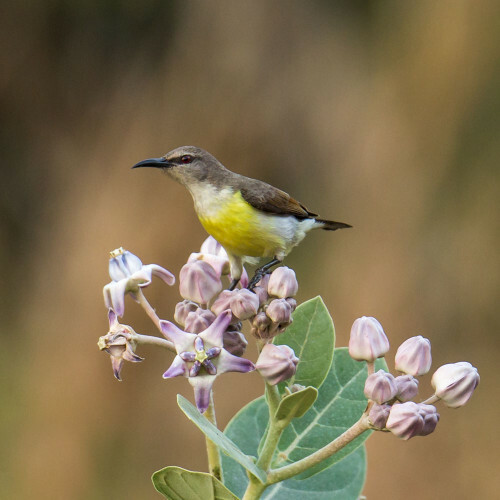 Purple-rumped Sunbirds are tiny at less than 10 cm long. 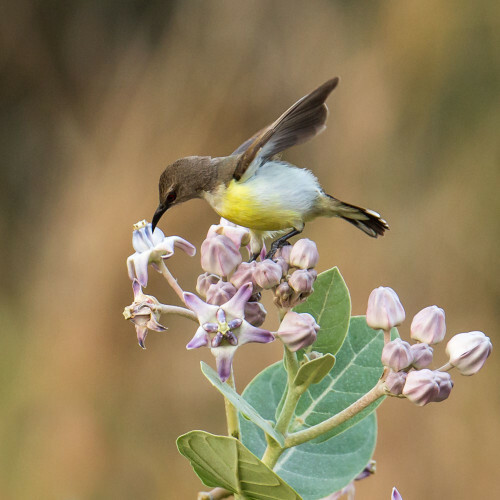 They have medium-length thin down-curved bills and brush-tipped tubular tongues, both adaptations to their nectar feeding. 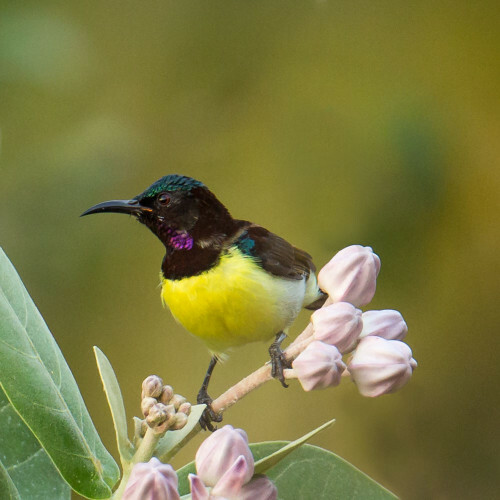 Purple-rumped Sunbirds are sexually dimorphic. 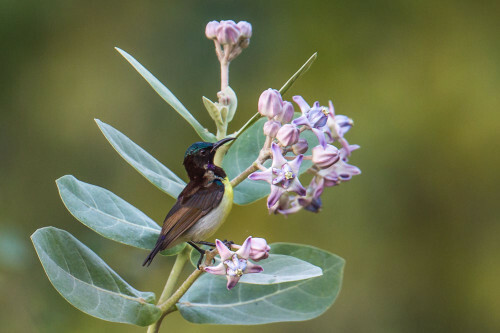 The males have a dark maroon upperside with a blue-green crown that glistens in some angles, bright green shoulder patch and violet/purple rump patch which is generally hidden. The underparts are whitish with dark throat, maroon breast band and purple/violet patch in the throat which is visible in some angles. The iris is generally reddish in color. 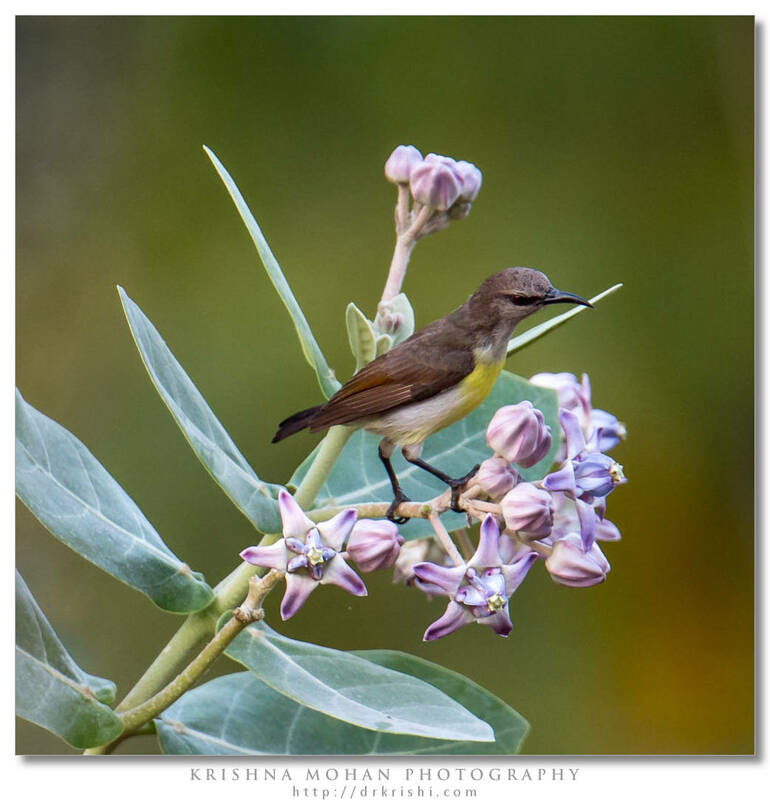 In the Western Ghats, it can overlap in some areas with the Crimson-backed Sunbird but male of that species has reddish upperparts, a broader breast band and generally darker eyes. 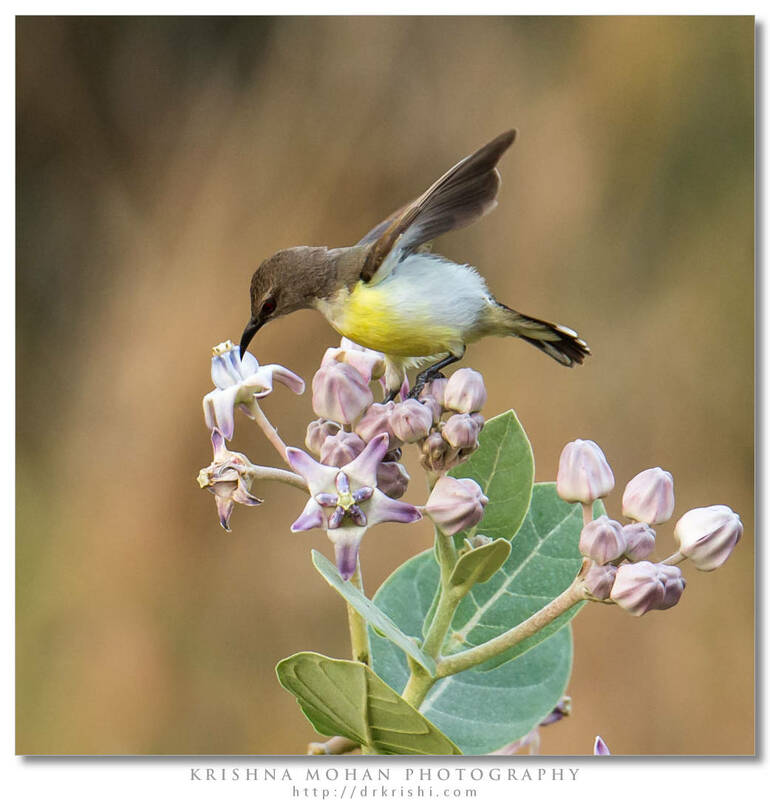 The female has a white throat followed by yellowish breast. The upperside is olive or brownish. The uppertail coverts are black and a weak supercilium is visible. 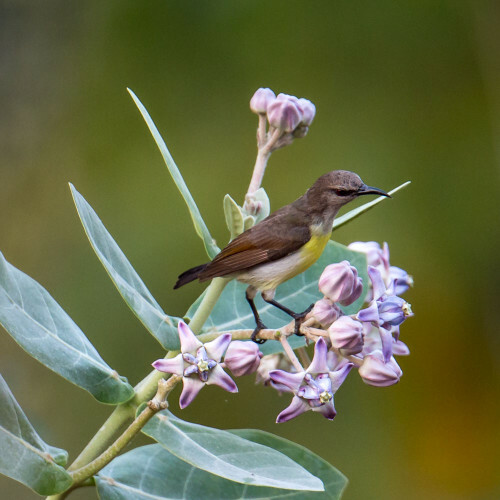 The nominate form is found in Sri Lanka and has a more bluish violet throat whereas the Indian form flaviventris (two other proposed populations whistleri from Maddur in Karnataka and sola from Pondicherry are subsumed) has a more pinkish tinge. Their call is ptsiee ptsit, ptsiee ptsswit or a sharp twittering tityou, titou, trrrtit, tityou…. 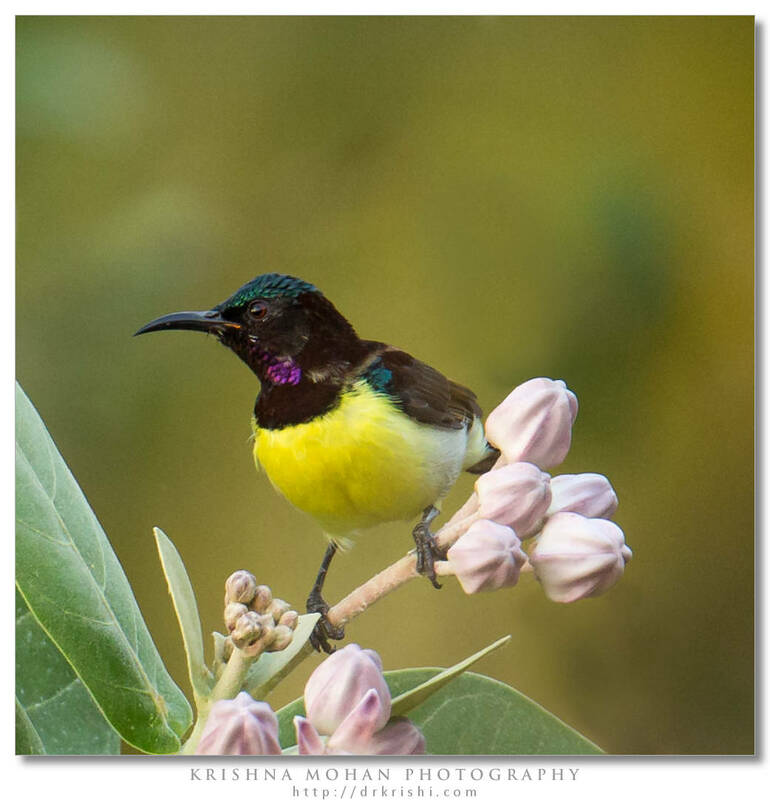 Purple-rumped Sunbird is a common resident breeder in southern India, Sri Lanka and Bangladesh. It is found in Gujarat to the west (possibly a recent expansion) and extending into Assam (Hailakandi) or Meghalaya in the east. Records from Myanmar are not certain. This species is found in a variety of habitats with trees, including scrub and cultivation and is usually absent from dense forest. 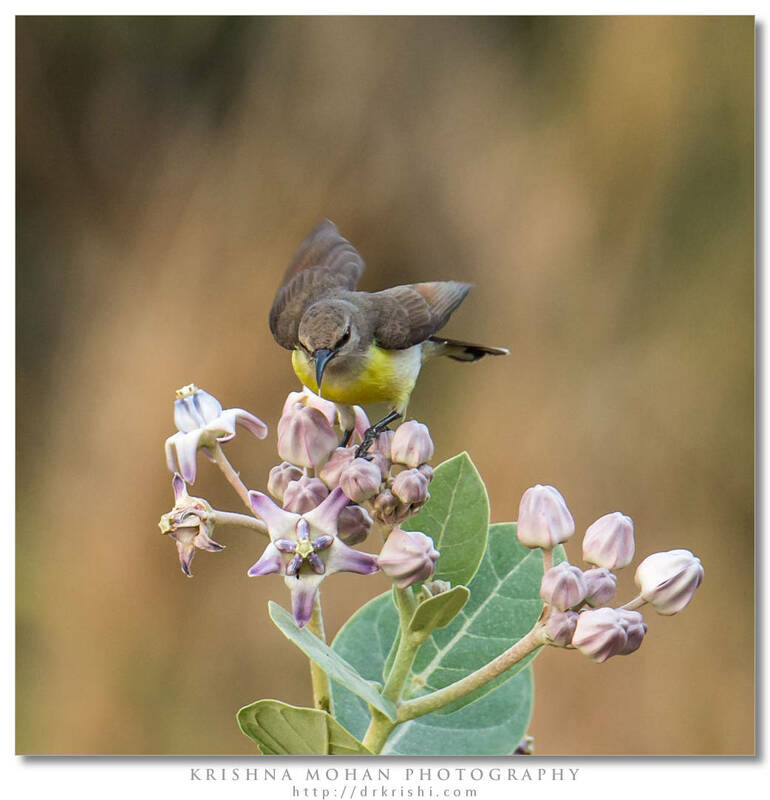 They breed through the year and may have two broods, but mainly during the monsoons. The nest is made up of fine plant fibers, cobwebs and is studded on the exterior with lichens, bark pieces, flying seeds and other materials. The nest is constructed by the female alone although the male may fly alongside her. The nest is lined with soft fibers from seeds of Calotropis. The nest is placed on the end of branch and the entrance usually faces a bush. Nests may sometimes be built close to buildings or under open porches. The female stays in the nest at night a couple of day before laying the eggs. The clutch consists of two eggs which are generally oval, pale greenish and white with spots and streaks, becoming more dense at the broad end. Sometimes, eggs may be plain grey without markings as well. When collecting cobwebs they are often seen at windows of homes. The eggs are laid mainly in the morning. The eggs are incubated by both the male and female. The incubation period varies from 14 to 16 days. The chicks fledge in about 17 days and continue to be fed by the male for a few days. Helpers, females or possibly juveniles from the previous brood may sometimes assist the parents in feeding the young. Old nests are sometimes reused. Cases of nests being parasitised by the Grey-bellied Cuckoo are known. 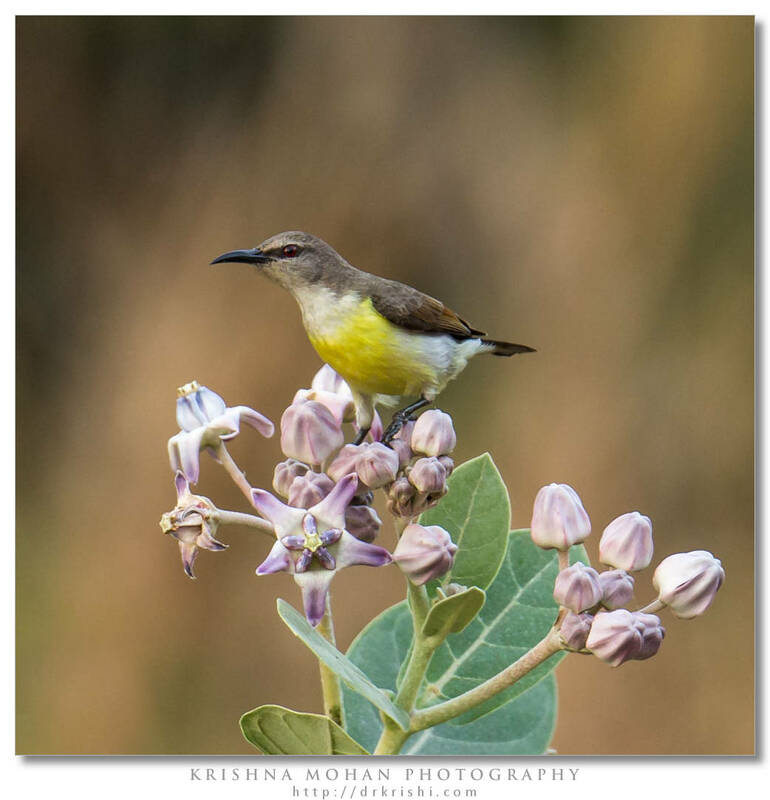 In one case the cuckoo was fed by an adult sunbird as well as an adult Common Tailorbird. EXIF info - Aperture : ƒ/6.3 | Camera : Canon EOS 5D Mark III | Taken : 30 December, 2012 | Flash fired : no | Focal length : 600mm | ISO : 1250 | Location : 12° 55.3451′ 0″ N 74° 51.989′ 0″ E | Shutter speed : 1/320s | Images and content Copyright © Krishna Mohan. 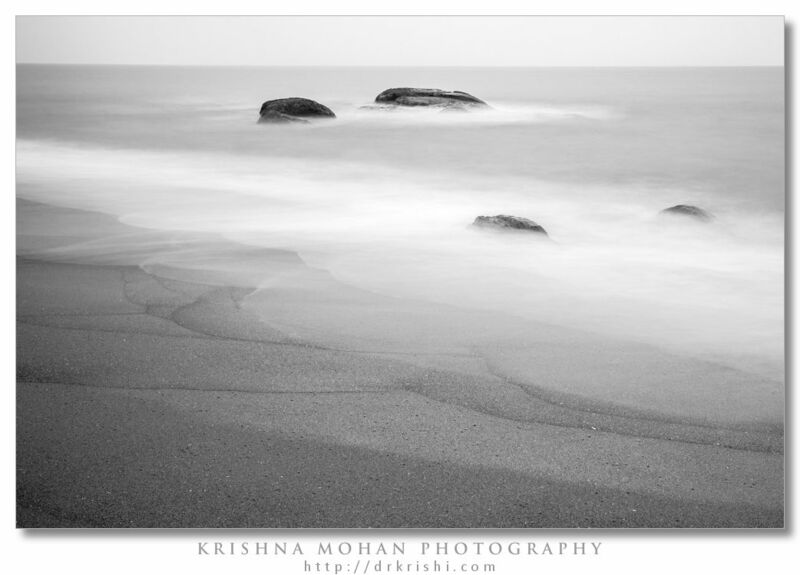 Please contact me to purchase prints or for image publication license. ಸೂರಕ್ಕಿ ಗಾತ್ರಕ್ಕೆ ಪರಪುಟ್ಟ ಕೋಗಿಲೆ ದೊಡ್ಡದಾದರೂ ಈ ಕೋಗಿಲೆ ಮರಿ ಸಣ್ಣದ್ದೇ. 23 ಸೆಂಟಿಮೀಟರ್ ಗಾತ್ರವಿರುವ ಈ ಕೋಗಿಲೆ ಎಲ್ಲಾ ಕೋಗಿಲೆಗಳಲ್ಲಿ ಸಣ್ಣ ಗಾತ್ರದ್ದು. ಹಾಗಾಗಿ ಈ ಸೂರಕ್ಕಿ ಗೂಡಲ್ಲಿ ಮರಿಯಿಡಲು ಸಾದ್ಯ. ಮರಿ ಉಳಿದವುಗಳಿಗಿಂತ ಗಾತ್ರದಲ್ಲಿ ದೊಡ್ಡದಾಗಿ ಎಲ್ಲ ಆಹಾರವನ್ನು ಅದೇ ನುಂಗುತ್ತಿದ್ದರೂ ಸೂರಕ್ಕಿ ತನ್ನ ಮರಿಯೆಂದುಕೊಂಡೇ ಅದನ್ನು ಪೋಷಿಸಿ ಬೆಳೆಸುತ್ತದೆ.